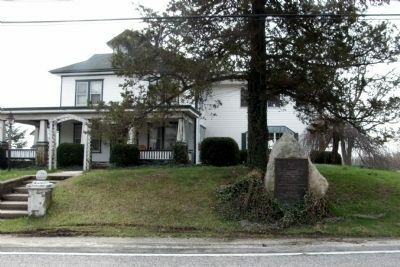 The farthest north attained by any organized body of the Confederate Army of General Robert E. Lee was reached here at the farm of Joseph Miller on the morning of June 28 1863. Hearing that Sterrett's Gap was occupied by Union troops these outposts returned to their command at Carlisle. From these hills the tide of Confederate invasion receded destined never to return. 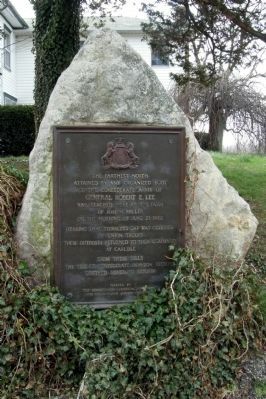 Erected 1929 by Marked by the Pennsylvania Historical Commission and the Hamilton Library Association. Location. 40° 16.96′ N, 77° 8.894′ W. Marker is near Carlisle Springs, Pennsylvania, in Cumberland County. Marker is on Spring Road (Pennsylvania Route PA-34) one mile north of Wertzville Road (Pennsylvania Route PA-944), on the right when traveling north. Touch for map. Marker is at or near this postal address: 3680 Route 34, Carlisle PA 17013, United States of America. Touch for directions. Other nearby markers. At least 8 other markers are within 6 miles of this marker, measured as the crow flies. The Route of United States Army Despatch Riders / Confederate Soldiers Farthest Advance (approx. 1.2 miles away); Stony Ridge Convention (approx. 4.2 miles away); Reformed Presbyterian Church (approx. 4.8 miles away); William Bigler (approx. 5 miles away); Dromgold Farm (approx. 5 miles away); Truscott Hall (approx. 5 miles away); Carlisle Barracks (approx. 5.1 miles away); U S Army War College Alumni Memorial (approx. 5.1 miles away). More about this marker. Is is very easy to drive right by this marker if you are looking for the more common blue and yellow marker on a pole. More. Search the internet for The Farthest North. Credits. This page was last revised on June 16, 2016. This page originally submitted on May 4, 2011, by Larry Gertner of New York, New York. This page has been viewed 785 times since then and 15 times this year. Photos: 1, 2. submitted on May 4, 2011, by Larry Gertner of New York, New York. • Craig Swain was the editor who published this page.